THE State Government has bought prime birdwatching land north of Adelaide in the hope it will become a tourism drawcard. The 2300ha sits along a 60km stretch of land from Barker Inlet to Parham, costing a total of $2 million. Environment Minister Ian Hunter said the land, which consists of salt flats, had the potential to lure interstate and overseas birdwatchers. "At the peak of the migration season in summer more than 25,000 birds gather here, with many coming from as far away as Alaska," he said. "This international bird sanctuary ... has the capacity to be a great asset that supports both tourism and the environment." Birdlife Australia chief executive Paul Sullivan agreed the sanctuary could be a major drawcard. "It's good for conservation and has the potential to become a social and economic asset," he said. The State Government will commit $1.7 million over four years to the establishment and maintenance of the sanctuary. I've lived here my whole life but I've never turned off Port Wakefield Road and explored the stretch of coastline from St Kilda to Port Wakefield itself. I know a good part of it would be mangroves - is there much potential beyond that? ABC North and West SA, Port Pirie, Mornings, Sarah Tomlinson, Interview with Brian Blaylock, Birds SA, regarding the state government plan to turn some salt flats between Barker Inlet to Parham into an international bird sanctuary. sanctuary should help attract many more. The above link contains a colour coded map image. PLANS for a bird sanctuary stretching along 60km of South Australia's south coast from Dry Creek to Parham has raised doubts about using land west of Port Wakefield Rd for housing. The government last week bought 2300ha of salt flats from the Ridley Corporation for $2 million to create an international bird sanctuary. The deals comes a year after Ridley Corporation said it was in talks with the government about a plan to build 10,000 homes on its salt fields. However this week Ridley Land Corporation general manager Steve Butler said the company was focused on closing and then selling the saltfields at Dry Creek. “Ridley’s plan is to close its facility and exit the site,” Mr Butler said. Ridley Corporation no longer needs the land as it was used to produce salt for Penrice, which closed its operations at Osborne in June. Salisbury Council has long been pushing the idea of building more homes west of Port Wakefield Rd and Salisbury Highway — a move partly contingent on relocating the Bolivar Waste Water Treatment Plant. Environment Minister Ian Hunter this week said there was no intention to move the Bolivar Plant as its ponds helped “preserve the conditions which provide a habitat for the birds”. Mr Hunter said the sanctuary could be expanded to include more land in Dry Creek. 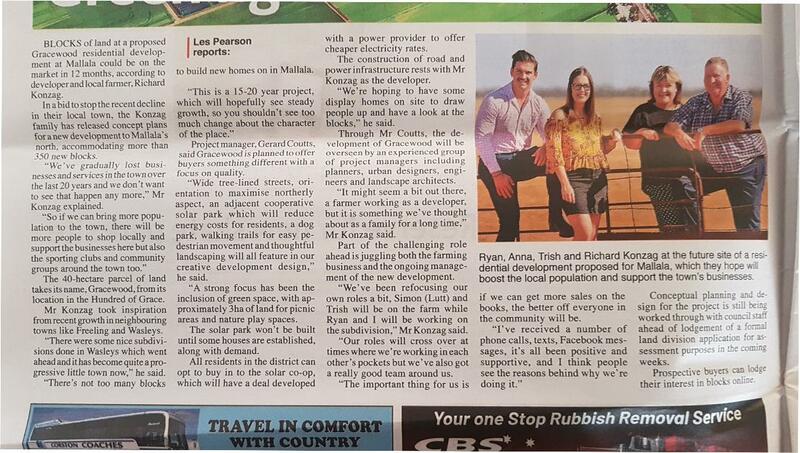 “In the longer term, there may be an opportunity to extend the park to include Crown Land currently part of the saltfield, however this would not occur until (closing the saltfields) has been completed,” Mr Hunter said. Salisbury Mayor Gillian Aldridge said the Bolivar plant needed to go. “I think it’s time to move it,” Ms Aldridge said. Ms Aldridge said the council would speak with the State Government about its plans for the rest of Ridley Corporation’s land at Dry Creek that is up for sale. “I think it could be an outstanding development there but if the State Government have plans for a bird sanctuary there we have to work with them,” Ms Aldridge said. More than 200 species of birds have been recorded at the Dry Creek saltfields, including the sooty oystercatcher, the bar-tailed godwit, the red-necked stint and the banded stilt. The State Government will spend $1.7 million over four years to develop a management plan for the park, prepare the site with works such as pest control, rehabilitation, weeding and fencing, and build visitor facilities, such as boardwalks, signage and bird hides. Birdlife Australia chief executive Paul Sullivan said the bird sanctuary could be a drawcard for birdwatchers from all over the world and would deliver good environmental and economic outcomes. What a poorly constructed sentence. Migratory birds that travel up to 20,000 kilometres to breed in the Arctic Circle are currently eating their fill along the beaches north of Adelaide. One recently returning bird, a bar-tailed godwit tagged AKK, has been photographed by volunteers of the Global Flyway Network in China and by volunteers of Birdlife Australia at Thompson Beach, near Adelaide, to document his amazing journey. "Over a week to nine days they seem to fly non-stop all the way up to China and then they make their way further north to the Arctic for the Arctic summer," manager of Coastal Marine at the Natural Resources Adelaide and Mount Lofty Ranges centre, Tony Flaherty, said. The birds spend six months of the South Australian spring and summer gorging themselves, increasing their weight by up to two to five times, before setting off on the trek. Stopping off in areas throughout China and Korea, the birds once more feed up before continuing north. Arriving in the Arctic Circle, the birds then pair, breed and nest and raise their young for approximately eight weeks before beginning the journey south. A coloured lag band was placed on the male bird dubbed AKK in November 2012 at Thompson Beach to attempt to track the flight path of the species. The bird was then photographed at Nanpu, near Beijing, in April 2013 by South Australian Global Flyway volunteer Adrian Boyle. Local Birdlife Australia volunteer Peter Corcoran photographed AKK a few weeks ago at Thompson Beach, confirming the area had become an important part of the bird's migratory cycle. On his feeding cycle near Adelaide, AKK is a fairly innocuous brown and white feathered shorebird. As he travels north, a thicker coat of feathers is produced, changing his appearance completely. "When they are up in the Arctic, they are in these beautiful russets and reds and other colours that blend in with the Arctic tundra," Mr Flaherty said. The spanning mudflats of Gulf St Vincent are described as a "shorebird supermarket" by Mr Flaherty. "There is this incredible diversity of invertebrates and shellfish that are in the tidal mudflats that provides an abundant food source to support up to 20,000 of these migrants and other resident birds." Upon arriving at the sites around the Gulf St Vincent, the birds are very skinny. "What is bringing them here is food and rest," Mr Flaherty said. Over the Australian summer the birds will increase their body mass by up to five times that of their arrival weight. Mr Flaherty said migratory birds that were found in the area were a "terminal population" that would return to the same sites each year. "It's [Gulf St Vincent] been recognised for decades in supporting a couple of species of waders, like the sharp-tailed sandpiper and red-necked stint, and it is internationally important because of that," he said. Mr Flaherty said it was crucial that areas of the mudflats were reserved so the birds were not disturbed and forced to move on. "The areas that these birds have historically used for millennia are being developed on throughout their flyway," he said. Tracking research of shorebirds throughout their flight path was revealing numbers were declining heavily due to loss of habitat along the migration pathways. Mr Flaherty said volunteers and staff from the Natural Resources department will attempt to place minute satellite tracking devices on the local bar-tailed godwits and other shorebirds in early 2015 to collect data on the birds' migratory paths. "Knowing an individual bird and what it is doing is important for planning how we manage our coast as well." Hopefully there's plans for a passenger rail line to connect them both to Adelaide. GoodSmackUp wrote: Hopefully there's plans for a passenger rail line to connect them both to Adelaide. Unfortunately not, but maybe once the rail component of the Northern Connector is built, they will hopefully introduce some passenger services on the branch line from Salisbury. 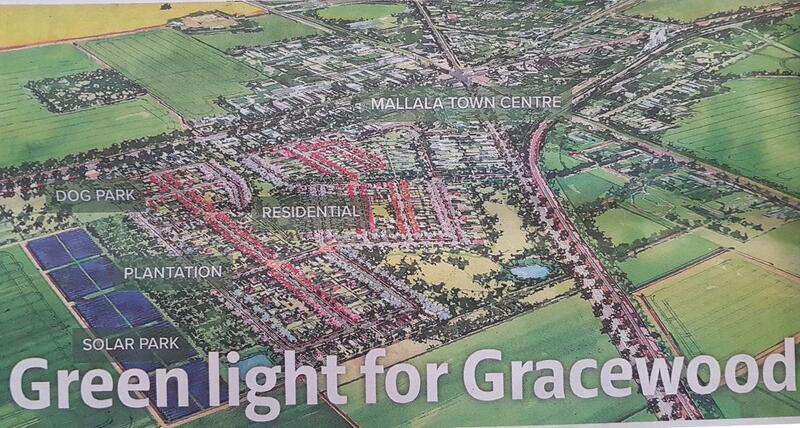 Looks similar to the Two Wells development. Once the Northern Connector and South Road is finished it would be a pretty quick trip into the city and western / southern suburbs. It would make more sense to sell it as close to employment in the northern suburbs and lower mid north (livestock markets, Balco, Abbatoir etc). The problem will be when people buy a nice quite block of land in a country town, then discover the interstate railway line on one side, and a motor racing circuit on the other side, just off the left side of the picture. I wonder how big the blocks would be to entice people out there? It says wide, tree-lined streets, I hope the blocks are a decent size (around 1000 sq m) too. I honestly don't see any need for medium density in some of our country towns, and it sounds like this is more of an altruistic development to save the town, than a money-grab. I hope it works for them. Disappointing more prime farming land is being developed into housing.